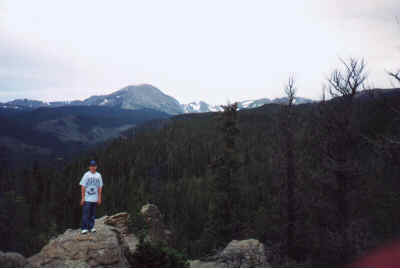 This page is devoted to my trip to Colorado State University this summer. My friend Simon and I took a bus there. (Drove from my house to Iowa, took a bus to CSU from there) So far, I've only scanned in the pictures from the mountain, but I might put some CSU pics in later. 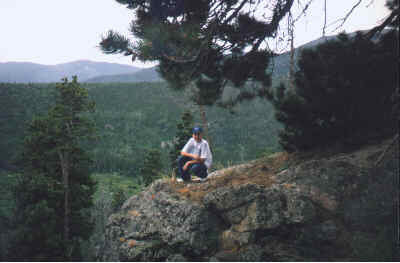 Me, on a rock formation just to the left of the path. Think we can get up there? 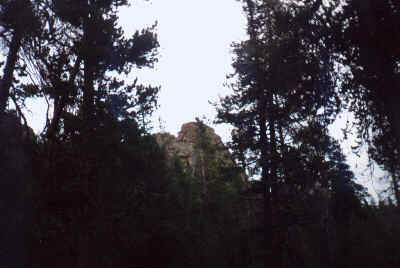 That is the shot of the huge bluff that we left the trail to go to. 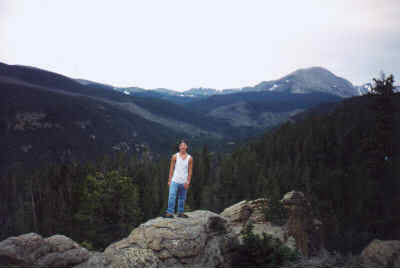 Simon took the picture of me up on top of the bluff pictured below. This was the second highest point on the mountain, so we could basically see everything. My friend Simon in the same spot as me in then picture above.